We begin the conversation on weight loss by stating that we believe there are only two ways to truly manage weight, through exercising and eating healthy. There simply is no magic shortcut, and while this may seem obvious to some people it is overlooked far, far, too often. Now you’re probably wondering, if diet and exercise are the only ways to lose weight, why should we have this site? Because there are still natural remedies and recipes that will help you reach your ultimate goal. If you use these in addition to eating better and getting some exercise, they can speed up the process. There are many different contributing factors to losing/gaining weight, so the below remedies cover a wide range. Ginseng is any one of 11 perennial plants with fleshy roots belonging to the genus Panax. While there are different kinds of ginseng, the two that you should use –also the ones that have had the most controlled double-blind studies done on them-are American ginseng (Panax quinquefolius) and Asian or Korean ginseng (Panax ginseng.) While widely known as a stimulant to speed up a sluggish metabolism, that description doesn’t do it justice. Ginseng’s greatest quality is that it can help fight fatigue and boost energy as well as mental alertness (in a randomized double-blind study in 2010 290 cancer patients at the Mayo Clinic were given ginseng daily and it was found to fight even the crippling fatigue caused by chemotherapy.) This is huge when it comes to weight loss-without energy, it’s hard to exercise. Without exercise, it’s near impossible to lose weight-at least in a healthy way. In addition to boosting energy, there is tentative evidence that it can help manage blood sugar, which also affects energy levels as well as appetite. Roughly chop the root and measure out 1 teaspoon per cup of water. Bring water to a boil and then pour over the ginseng, allowing it to steep for 5-9 minutes. Strain, add honey or lemon if you like, and drink 1-2 times daily. Dandelion and peppermint tea is a fabulous drink that will help keep your liver healthy. The liver is an incredible organ. Not only is it the only way to truly detoxify your body, it is also plays a central role in many metabolic processes-a lot of which affect weight. In terms of fat metabolism, the liver is full of cells that break down fats and turn them into usable energy. These cells are also responsible for the flow of bile, which helps breakdown and absorb fats. In the metabolism of carbohydrates, the liver helps keep your blood sugar steady, therefore keeping energy levels up and regulating appetite. The list goes on, but the point is helping your liver helps your weight, as it plays a crucial role in managing fats and their absorption. Dandelion and peppermint both help your liver. Dandelion has hepatoprotection constituents, with hepatoprotection meaning an ability to prevent damage to the liver. Peppermint and dandelion both automatically stimulate the production of bile in the liver, helping with digestion and the absorption of nutrients. Mix these two together, and you have a powerful liver protecting tea! Pour a cup of boiling water over the dandelion and peppermint and steep, covered, for 5-10 minutes. Strain, add lemon to taste if you like, and drink a cup twice daily. You can also make this with fresh dandelion leaves/roots and fresh peppermint, just use a rough handful of the fresh leaves for the amount. If you do use fresh, be absolutely certain that there have been no chemicals applied to them- this is especially important for dandelion. If you use dandelion on a regular basis, I suggest growing your own. We live in a hectic world, and most of us are stressed about one thing or another on a daily basis. The thing is, our bodies weren’t made to handle constant stress, and it can have damaging effects on a wide variety of functions-including weight gain/loss. When under stress, the body releases cortisol, a steroid hormone that is part of the fight-or-flight response. Cortisol can effect blood sugar level (therefore appetite), and cause energy to be stored more readily as fat. Neuropeptide Y is a neurochemical that is also related to stress. When released, it causes growth of fat tissue (energy is stored easily as fat around the abdomen) as well as an increase in appetite. One way to fight this underlying stress can be to ingest more sage, which has calming effects on both the body and mind. Making a calming sage tea, or even just adding it in dishes you cook, is one way to help combat your stress levels. Pour boiling water over sage and steep for 4-5 minutes. Strain, add lemon to taste if you like, and drink 1-2 times daily. Chewing gum is a great way to trick your brain (and your stomach) into thinking it’s getting more than it is. The flavor of the gum reduces appetite and curbs the urge to snack on something unhealthy, and also stimulates the flow of saliva, whose enzymes help break down starches and fats. When you feel the need to start munching, pop in a piece of gum instead. Having a routine is, in my opinion, in the top three most important things you can do to lose weight, right up there with exercise and diet. If you don’t stick to a routine, you won’t see results, and you’ll be discouraged. 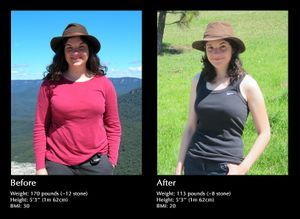 Several years ago I saw a personal trainer and, after paying a decent sum of money, I figured out that it was the routine of going to see her made the biggest difference. It’s probably the single hardest thing you’ll do when you try to lose weight, but once those habits become hardwired into your brain, things will only get easier. Staying hydrated is an important aspect of weight loss that people often brush off-you don’t want to gain water weight and feel bloated right? Either that or you hear that you should drink ice cold water to burn more calories. Not exactly. The idea that ice cold water burns more calories because your body tries to “warm it up” first may technically be true, but the effect is miniscule (like 8 calories miniscule.) Rather, you need to be hydrated for your body to run smoothly, and that includes burning fat. It flushes bad stuff through your system, and also helps curb appetite. And don’t fret about water weight-if you are staying hydrated, your body is less likely to retain water since it simply doesn’t have the need to-similar to how eating more can make weight loss easier, within reason. I should also say-DO NOT BUY INTO SPECIALTY WATERS! Get your vitamins through your diet or supplements. Those waters are not better for you-in fact some are so loaded with flavoring and what not they rival soda. In the 1970’s and ‘80’s, saturated fats got shoved into the spotlight as the main cause for obesity. Coconut oil, being a saturated fat, was tossed along with the rest of them. The healthier alternative that we created? Trans-fat. One could say that backfired a wee bit eh? Coconut oil isn’t just any old saturated fat though; it contains unique fats called medium chain triglycerides that help you use energy (aka calories) more efficiently. MCT’s are indeed a saturated fat, but they are not the same as many of the other saturated fats we hear about-those fats are long chain triglycerides. Why does the length matter? Its chemical makeup is what determines how our body processes it and breaks it down. MCT’s are not broken down in the intestines, and therefore do not get stored away immediately as fat. Instead, they absorbed intact and sent right to the liver, where they are used as energy. Now sitting around eating coconut oil isn’t going to make you lose weight, but using it as a replacement fat can be a good choice. In addition to that, just plain coconut oil is an incredible appetite suppressant (it’s almost scary, actually.) Tack on that it can raise energy levels and you are more likely to get out, move around, and exercise. As far as studies on it go, here are some that I mentioned in The Everyday Roots Book. In 2002 the Journal of Nutrition concluded that it can aid weight loss when used in place of long chain triglycerides. It was also shown to strongly curb appetite and it appeared to increase the burning of calories. In 2003 Obesity Research found that it may help burn calories, probably due to the fact that it boosted energy. In 2010 the International Journal of Food Sciences and Nutrition also found that it could help boost metabolism and reduce appetite. Twice a day, take 1 tablespoon of coconut oil. You can take it before, during, or after a meal. If you tend to struggle with proportions, I suggest taking it before you eat, or if dessert is your demon, take it right after dinner. In terms of substitution I’ve used it in place of olive oil and love it. This is an awesome breakfast/snack. It’s one of those “I wouldn’t guess this is good for me!” type foods. The probiotics in yogurt do wonders for the digestive track and maintains a healthy balance of gut flora that optimizes digestion and the breakdown of certain substances (like fat.) When you digestive track is running smoothly, your body is processing things better and it’s not as likely to pack on the pounds. The honey is just a little added (healthy) sweetness to satisfy any cravings you might have. The beautiful thing here is that you really don’t feel like you’re getting shorted any flavor or fullness when you eat it. For optimum weight-loss awesomeness, try low fat yogurt. Note: There was once a time when certain large companies began to add so much sugar to their yogurt the amounts surpassed those found in sugary breakfast cereal, like Lucky Charms. People were gobbling it up and wondering how it could be so tasty and good for you, when really the image and wholesomeness of yogurt was simply being abused. Read the nutrition label first. Eat this for a snack or breakfast, adding on the honey for flavor. Feel free to try adding fresh fruit or even oats for a little variety. This spicy little concoction contains black pepper and lemon juice to create a drink that can help you keep ahead on your weight loss battle. Black pepper contains a naturally occurring chemical compound called piperine, which is responsible for giving it its pungent flavor. Several new studies have shown that piperine can interfere with the genes that control the generation of fat cells, as well as reducing fat levels in the blood stream and enhancing the absorption of nutrients from our foods. Lemon juice can help aid in digestion and give your G.I. track a helping hand when it comes to breaking down foods. Mix lemon juice with water and sprinkle in black pepper (about 3-4 turns of the pepper grinder.) Drink once daily after a meal. Bottle gourds are old-world hard-shelled fruits that anecdotal evidence suggests can help you lose weight. People who swear by it find that, due to its high fiber content, it creates a sensation of fullness and curbs appetite. It also has high water content (always a good thing) and has a number of great nutrients. If you do decide to drink bottle gourd juice, do not do so in such a way that you use it to “starve” yourself (see below.) Your body needs all the (good) food and nutrients it needs to maintain a balanced diet, however, it’s a great way to help resist cravings and potential snacking sprees! When you feel the urge to snack, drink a glass of cold bottle gourd juice with a dash of lime juice added. Deprivation never works. It is a painful struggle that will almost always result in failure. Instead of starving your body of the nutrients it needs to stay healthy, eat “more” good stuff. Break your meals down to 5 or 6 small ones a day to reduce snacking (which is when a good chunk of weight gain takes place for a lot of people) and to prevent your body from storing more fat-which is does when it feels “starved.” Also ask yourself why you’re eating in the first place-we so often eat out of boredom or nerves or stress. Wait until you feel a rumble and let your stomach tell you when it needs to eat. An apple a day keeps the weight at bay! While not overflowing with nutrients like other fruits or vegetables, apples still have a number of benefits that can contribute to weight loss. First, they are packed with fiber, which helps curb appetite, so eat one when you feel the urge to snack on some less-desirable foods. Second, they can help regulate blood sugar levels, and therefore help regulate your appetite and energy levels. Third, the pectin in apples can lower cholesterol, and serve as another way to help regulate blood sugar, by slowing the absorption of carbohydrates. Finally, apples are a naturally low-sodium food, which can help prevent excess water retention and water weight. Rinse and slice an apple, and eat one to two daily. Leave the skin on, as that contains a good amount of fiber. Wash the asparagus and lightly peel the stems if they are thick. Place in a pan with ½-1 inch of water, and cover with a tightly fitting lid. Turn the heat to medium high and steam for 3 minutes, or until the asparagus is tender and can be pierced easily with a fork. Your brain lags behind your stomach by roughly 20 minutes, which ,means that it isn’t the best thing to rely on when it comes to letting your know when you’re full. To avoid over-eating, and thus consuming extra un-needed calories, slow down your eating by putting your fork or spoon down between bites. You might feel a little silly at first, but it can really help when it comes to managing your weight. Flax seed has been known to help with digestive ailments for centuries, and this goes hand in hand with weight loss. Flax seeds are high in fiber, as well as mucilage, which helps lower cholesterol. It has also been proven to lower blood sugar levels. With such a high amount of fiber, flax seeds also act as a natural gentle way to regulate bowel movements and help promote healthy gut bacteria, both which work well to help you manage weight. It is important to eat flaxseed ground, as it tends to pass through the digestive track undigested if eaten whole, thus depriving you of its nutritional benefits. Once a day eat a tablespoon of ground flaxseed-sprinkling it over cereal or oatmeal if my personal preference. on the packaging for dosage. Remember deprivation hardly works? When you get the urge for a sweet treat, turn to dark chocolate. It will help curb your craving thanks to its insulin-resistance lowering flavonoids. The healthy fats in dark chocolate can also slow the absorption of sugar into your blood stream, preventing “insulin spikes.” Studies have shown that eating some can help put a stop to cravings for sugar, salt, and fat. However, the chocolate must be 70% cocoa, otherwise it has too much milk or sugar added to be beneficial. Directly after a meal, eat a piece of dark chocolate roughly the size of your thumb to glean its benefits. Beans, beans, the magical fruit, the more you eat the more you…lose weight? Apparently, since the protein in navy beans can take a while to digest, therefore reducing appetite and aiding in weight loss management. The fiber in navy beans can also help lower cholesterol. Prepare the navy beans by adding 3 cups of fresh water to a pot for each cup of dried beans, so that the liquid level is about 1-2 inches about the beans. Bring the water to a boil and then reduce to a simmer, partially covering the pot. Skim off any foam that develops, and simmer for 1 to 1 ½ hours until tender. Add to a salad or enjoy as a dish on its own. When you’re trying to figure out how to lose weight, know that there really is no magic thing that works for everyone. Yes, diet and exercise are vital, but people are different, bodies are different, and you have to take into account things such as genetics, health conditions, gender, and age. You might be glaring at your co-worker chowing down on donuts at the office while you pick at a salad and wonder how they manage to stay so fit when they eat whatever they want-but don’t let this drag you down. The journey is different for everyone, but there is always a way to complete it. And when in doubt, simplify the situation-eat good food, get proper exercise. We’ve turned eating and weight loss into a science that delves into such minuscule things we feel like we aren’t capable of eating right or losing weight without professional help. Assuming you have no outstanding condition that complicates the situation, you can reach your goals on your own! It may be difficult, but hey, that’s where things like these remedies can lend a helping hand. -Weight isn’t everything. Muscle does weigh more than fat, and being fit and healthy is more important than being incredibly “thin.” Healthy looks good on you, and don’t forget it! -Never underestimate stress as a cause of weight gain. The body cannot perform any function, including burning fat for energy, optimally when under stress. -There are no super-foods. Don’t rely on one thing to help you lose weight-always maintain a balanced diet. -Don’t eat before bed. Your metabolism slams on the brakes when you go to sleep, so eating at night makes weight gain tough to avoid. -Get a buddy to make goals that the two of you strive towards. When you lose willpower or motivation, a friend can be all that stands between success and setback. -Read a book called Salt, Sugar, Fat: How the Food Giants Hooked Us In by New York Times investigative reporter Michael Moss. Just do it. It will give you something new and tangible to hold onto when you are trying to avoid junk food. At the risk of sounding corny, it actually changed my life. -Along the lines of the first tip-manage your weight to be healthy, and ultimately, happy. Ignore images of perfect figures. Forget about the silly things society bombards you with, telling you what you should look like. To say that’s easier said than done is the understatement of the century, but do try to keep it in mind. When you are healthy, and happy, you truly glow from the inside out.